You love your dog and would never hurt it? Then, you need the Humane Anti Bark Control Collar. 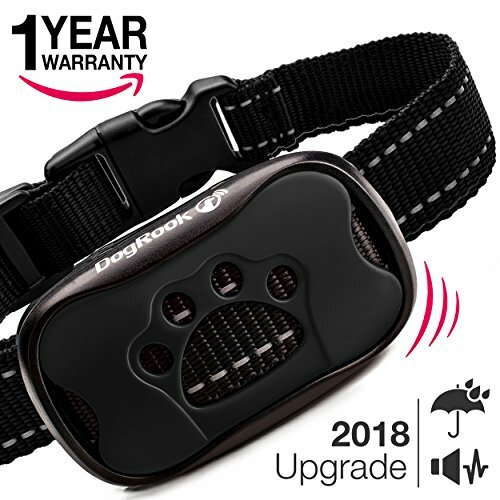 Our highly intelligent automatic bark collar will quickly and easily teach your dog not to bark, and thanks to the humane dog bark collar with only vibration and sound. Beep No Bark Collar is made of high quality, durable and safe materials. With seven highly sensitive sound and vibration levels, you can quickly and safely train your dog not to bark. The adjustable strap pet bark controls are made of durable nylon reflective material. Our dog barking collar are 100% waterproof, allowing you to walk or train your dog in any weather. The stop barking collar is an excellent choice for small medium and large breed dogs weighing from 11 up to 110lb with a neck size of 9 to 22 inches. In the beginning, adjust the sensitivity level of the bark with the help of the easy buttons, "+" and "- "
A warning tone will follow your dog's first and second bark. If your dog barks a third time, wireless no shock collar will meet the warning tone and vibration. The intensity of the vibration will be maintained until the 7th bark. Then turn on sleep mode, dog training collar will stop working for 1 minutes. Clicking The ADD TO CARD Button Right Now And Get Your DogRook Dog Barking Control ! ⚫️ NO SHOCK COLLAR, HUMANE CORRECTION -- With 7 safe vibration and sound levels, no harm dog training collar. Finally, you will be able to correct your dog's behavior with the best no bark control collar! ⚫️ 100% SERVICE AND GUARANTEED -- We are happy to provide full satisfaction with our Anti Barking Device. And offer 1 year warranty! Buy it with confidence! View More In Bark Collars. If you have any questions about this product by DogRook, contact us by completing and submitting the form below. If you are looking for a specif part number, please include it with your message.